First-generation Kwik-Lok gunwale tie-down is a simple, effective way to secure one of your boat's gunwales to your trailer while protecting the boat's finish. Buckle lets you tighten strap, allowing for rapid loading. 1,200 lbs Max load. 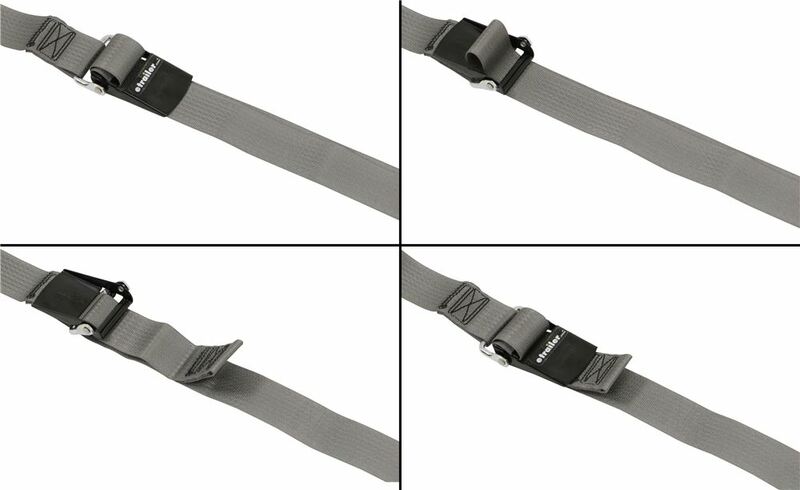 Lowest Prices for the best tie down straps from BoatBuckle. BoatBuckle Kwik-Lok Gunwale Tie-Down Strap - 2" x 10' - 400 lbs - Qty 1 part number IMF13113 can be ordered online at etrailer.com or call 800-298-8924 for expert service. First-generation Kwik-Lok gunwale tie-down is a simple, effective way to secure one of your boat's gunwales to your trailer while protecting the boat's finish. Buckle lets you tighten strap, allowing for rapid loading. 1,200 lbs Max load. Load your boat onto your trailer and open the buckle. Then connect the S-hook at the bottom of the Kwik-Lok strap to the side of your trailer's frame and connect the top S-hook to the gunwale of the boat. Pull the end of the strap through its buckle and turn the buckle down to tighten the strap. Note: Gunwale tie-downs should always be used along with a winch strap and a set of transom (stern) or bow tie-downs. All straps and cables should be chosen according to their safe working load limit (WLL). To determine the maximum load, or break strength, of the strap, simply multiply the WLL by 3. The WLL is always one-third (1/3) of the maximum load. It is recommended that you always use straps in pairs. The Pro Series system combines everything you need in a set of transom straps - strength, security and safety. These heavy-duty straps secure your boat's stern to your trailer and make the trailer more visible at night. 1,200 lbs Max load. The built-in shock absorbers on these 4 ratcheting straps compensate for the movement of your motorcycle's suspension so that each strap stays tight around the bike, even on rough roads. 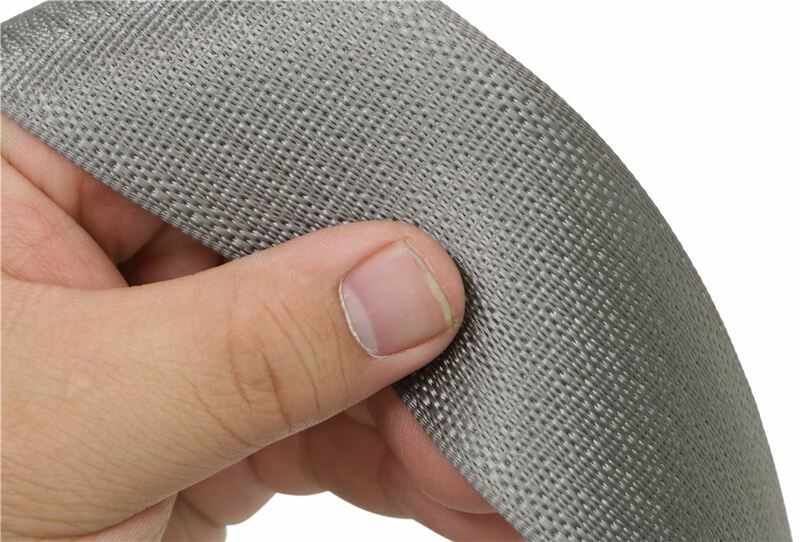 Soft ties won't scratch your bike. 3,000-lb Max load. Speaker 1: Today we're taking a look at the boat buckle quick lock gunwale tie down strap. 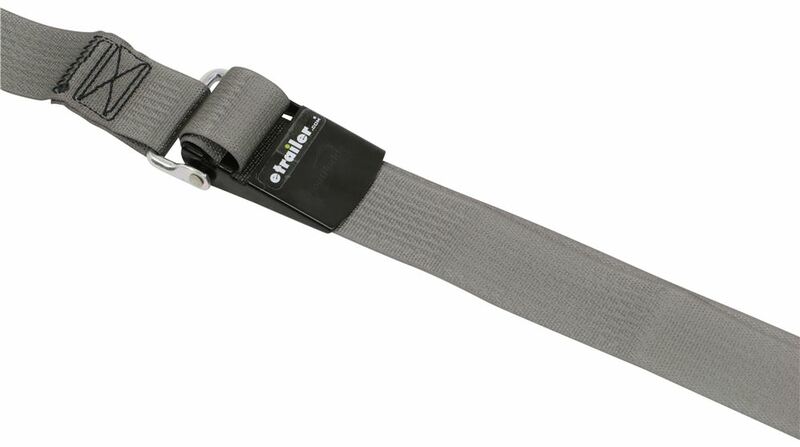 This gunwale tie down strap is designed to help secure your boat to your trailer. It simply keeps the rear of your boat securely in place on your boat trailer during transport. 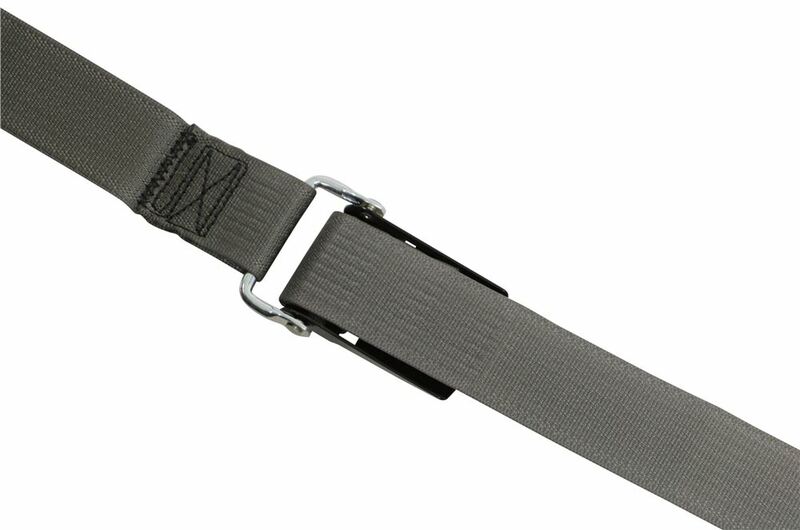 The strap itself is made from seatbelt quality polyester. It's very strong and durable. As you can see it's gray in color. This one contains a quick lock buckle. 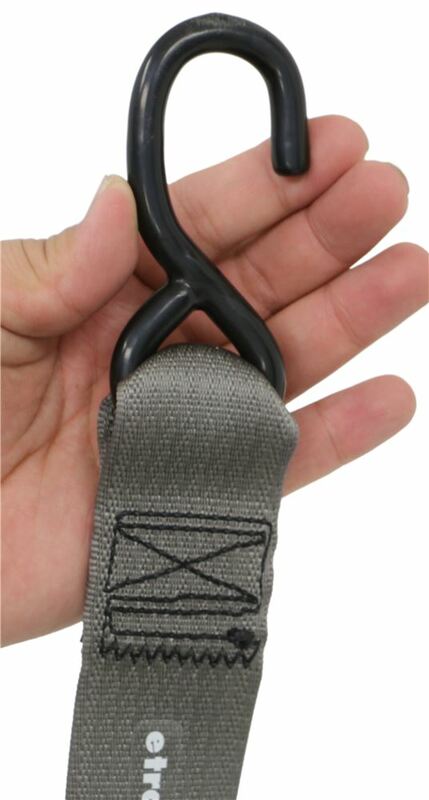 It's very easy to use and to operate.Now when tension is applied to the strap, the buckle can easily be used with one hand. With the buckle in the closed position, which is what it's in now, it's fully secure. It's not going to let the strap back feed, or it's not going to let the strap loosen. You can see here if I pull on the excess I can still take out any slack that I may have, but as far as the hook loosening, it's not going to release. It's a nice design of the unit. It's very secure and easy to use. Then the buckle can easily be moved to the open position in which case you can operate the strap in either direction, but when you're ready to secure everything and head down the road, you take this and make sure it locks into place. Then everything's tight and secure and you're ready to go.The S hooks on the unit are made from durable steel and they feature a nice vinyl coating so that's going to keep them safe from rust and corrosion. It also prevents them from scratching your boat or anything else that they come into contact with. One of the things I really like about this strap is that on this end this is our lead strap, it has a really nice long lead strap, so the buckle itself will be positioned towards the center of the boat and not off to the side.This strap is available in four different lengths at etrailer.com, 10 foot, 13 foot, 16 foot, and 20 foot. It measures two inches wide. The maximum load and break strength is 1,200 pounds. The safe working load limit is 400 pounds. Just always keep in mind that gunwale tie down should always be used along with a winch strap and a set of transom, stern, or bow, tie downs. All straps and cables should be chosen according to their safe working load limit.When using this strap it's really easy to do. You would fasten the hooks securely to the frame on both sides of the trailer with the fastener in the open position. You pull on the free end of the strap until it's tight. 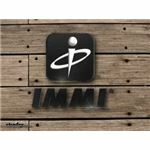 Then you close the fastener or close the buckle to the lock position and you're ready to go.For a 10 foot strap you can find it at etrailer.com with part number IMF13113. 13 foot strap is IMF13114. 16 foot strap is IMF13115. A 20 foot strap is IMF13116. That's going to do it for today's look at the boat buckle quick lock gunwale tie down strap. Order: RelevanceNewestRating - High to LowRating - Low to High First-generation Kwik-Lok gunwale tie-down is a simple, effective way to secure one of your boat's gunwales to your trailer while protecting the boat's finish. Buckle lets you tighten strap, allowing for rapid loading. 1,200 lbs Max load.